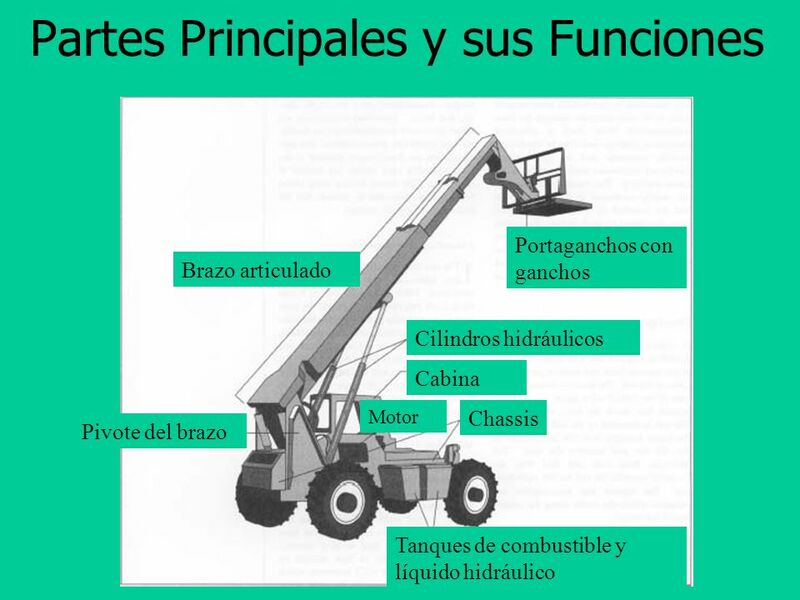 A “rough terrain forklift” means a wheeled-type truck which is designed primarily as a fork truck that has a vertical mast or pivoted boom, or both, which has variable fixed length reach and which may be equipped with attachments and is intended for operation on unimproved terrain as well as the disturbed terrain of construction sites. 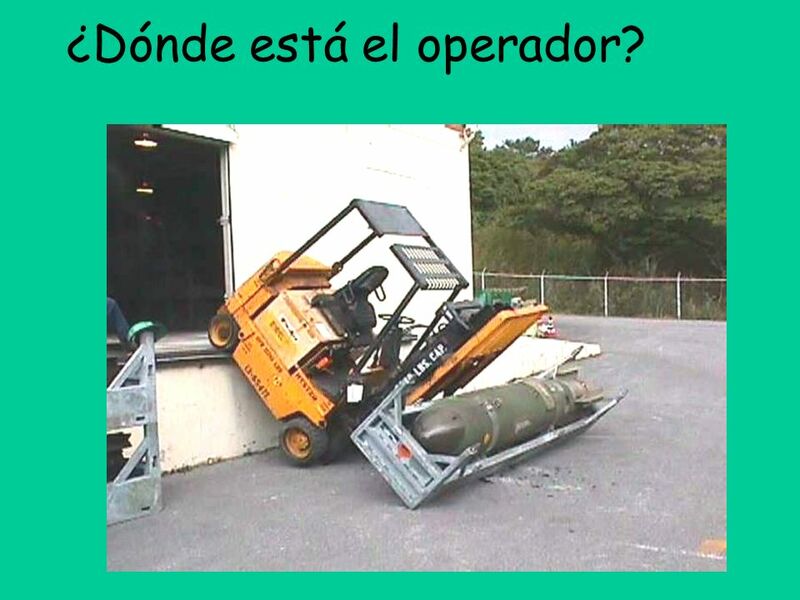 2 ¿Dónde está el operador? 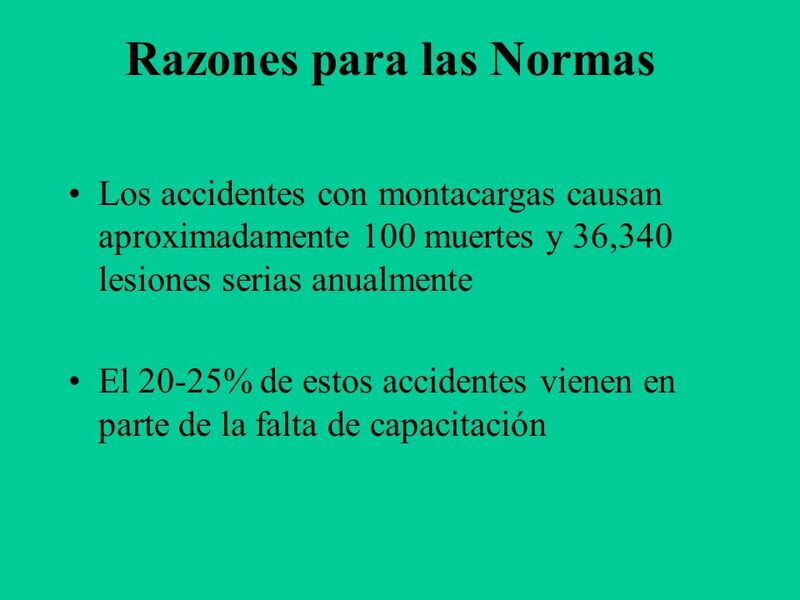 4 Meta Familiarizarse con los montacargas para así prevenir accidentes y muertos. 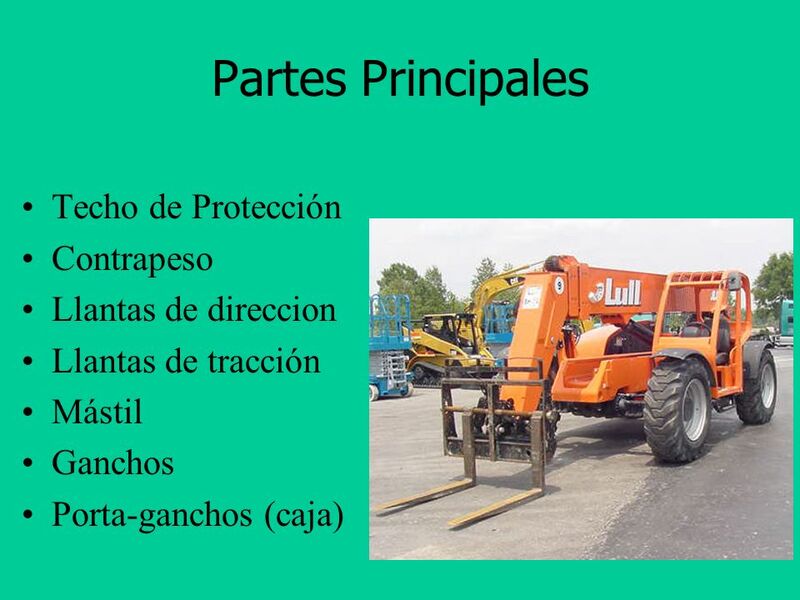 Repaso de los Requisitos de 29 CFR The goal of this section of warehouse safety is to familiarize employers and employees with PITs in order to prevent PIT-related accidents and fatalities. 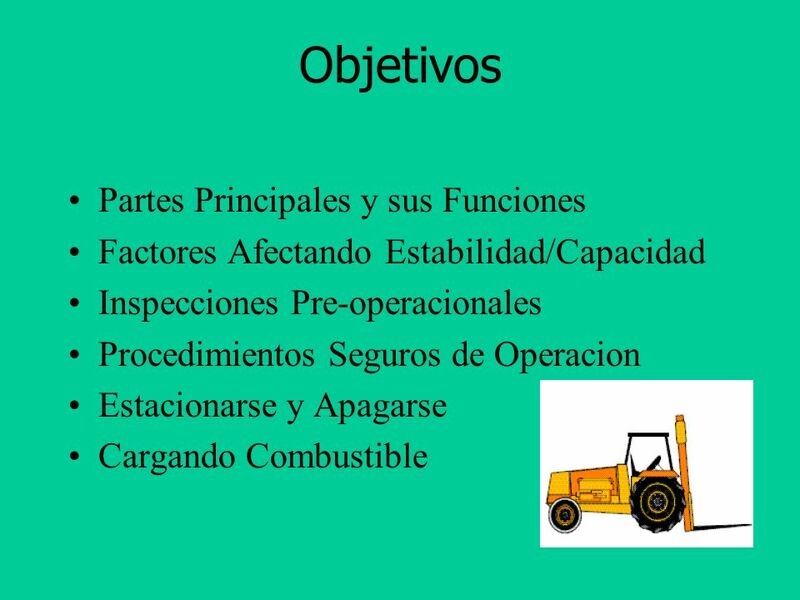 The material presented in this section is a starting point for employers who need to develop an effective PIT safety program. 12 ¿Qué? 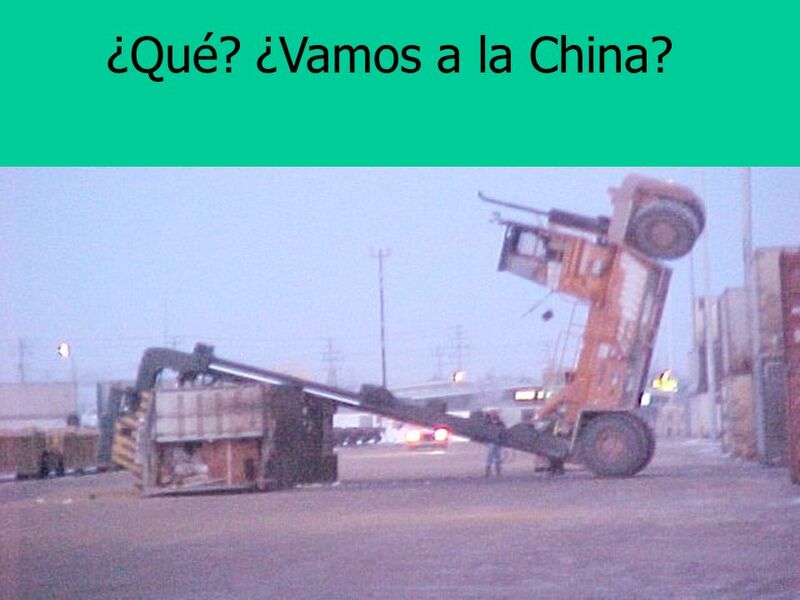 ¿Vamos a la China? 13 Centro de Carga La distancia entre el portaganchos y el centro de gravedad de la carga. 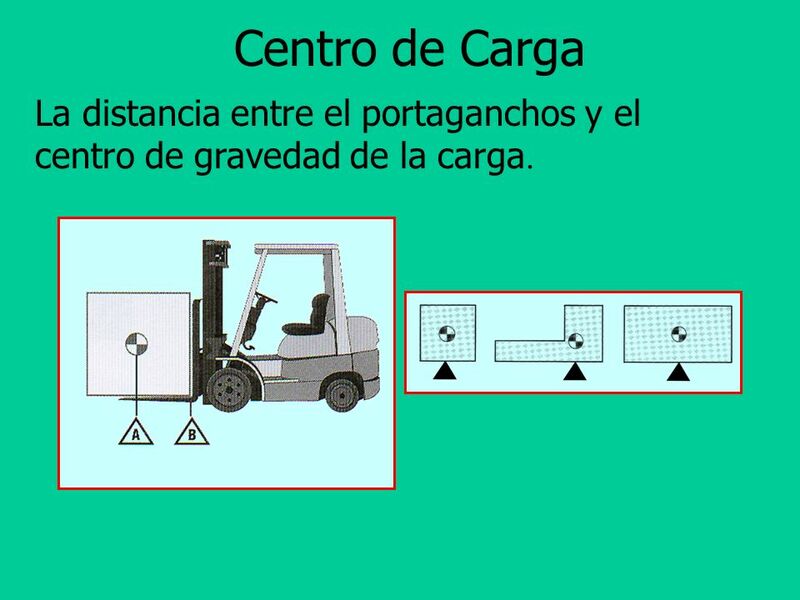 Illustration of load center and center of gravity. Load center typically 2 feet from fork rest. 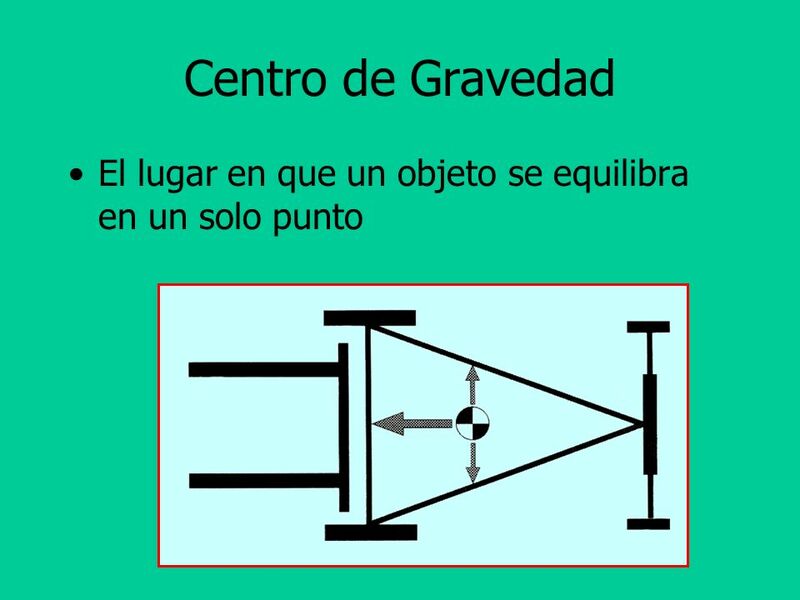 14 Centro de Gravedad El lugar en que un objeto se equilibra en un solo punto Definitions of load center and center of gravity. 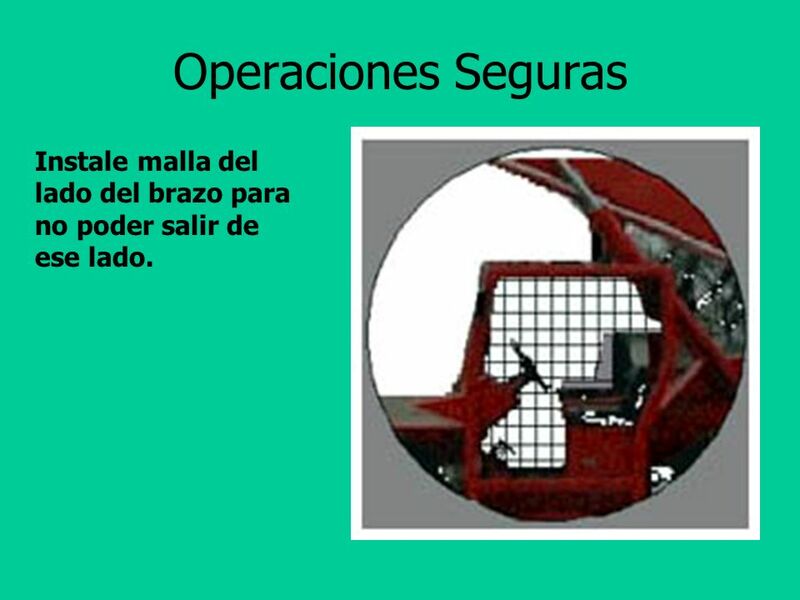 An operator who understands the practical applications of these two (2) concepts will make safer driving decisions. 15 El peso siempre va cuesta arriba. 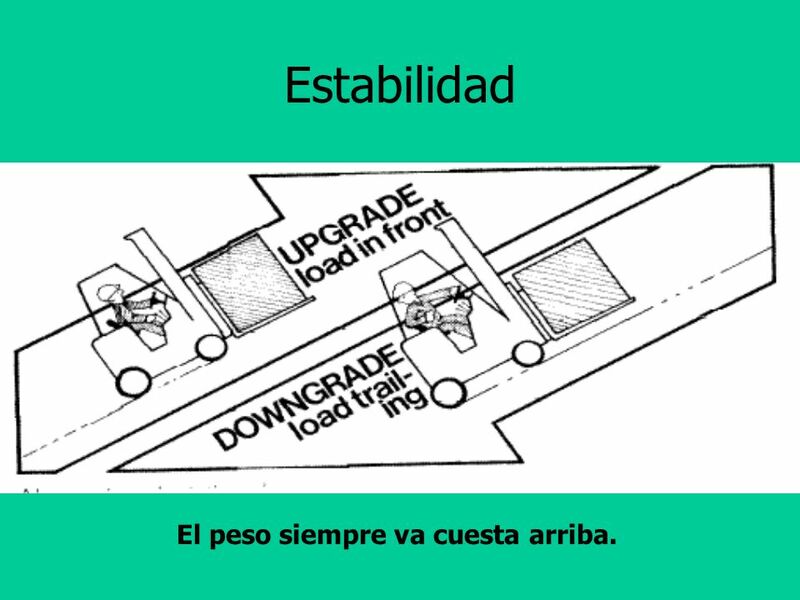 Estabilidad Load always goes uphill. 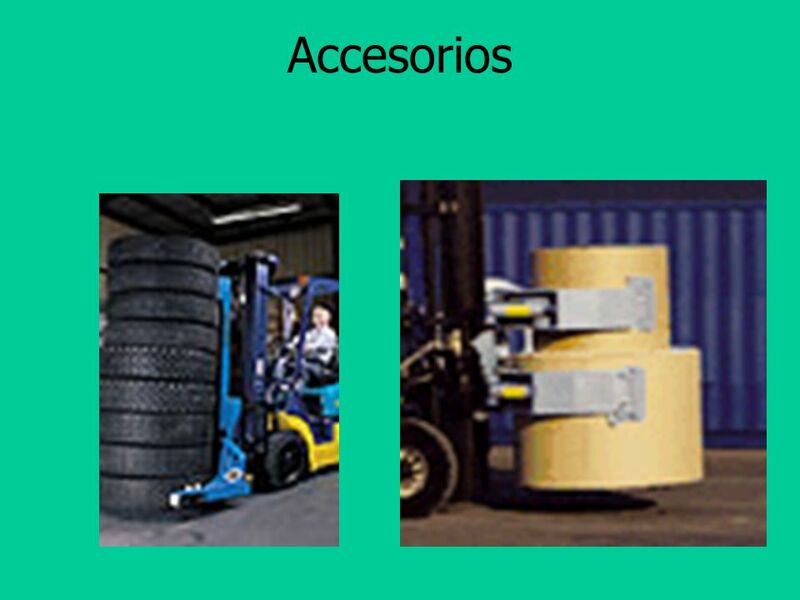 With no physical load, the counterbalance becomes the load. El peso siempre va cuesta arriba. 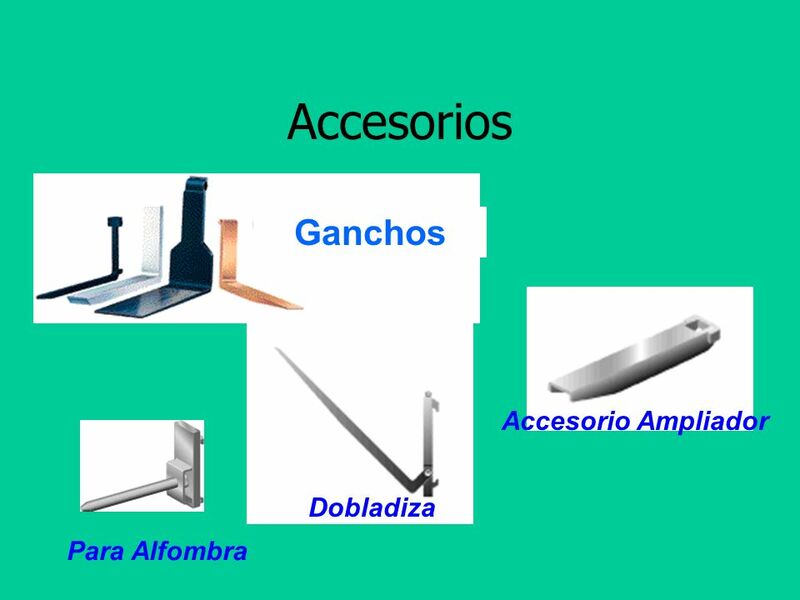 Tipos de accesorios The additional weight and length of attachments changes the center of gravity, load center, lifting height, and lifting capacity of the PIT. 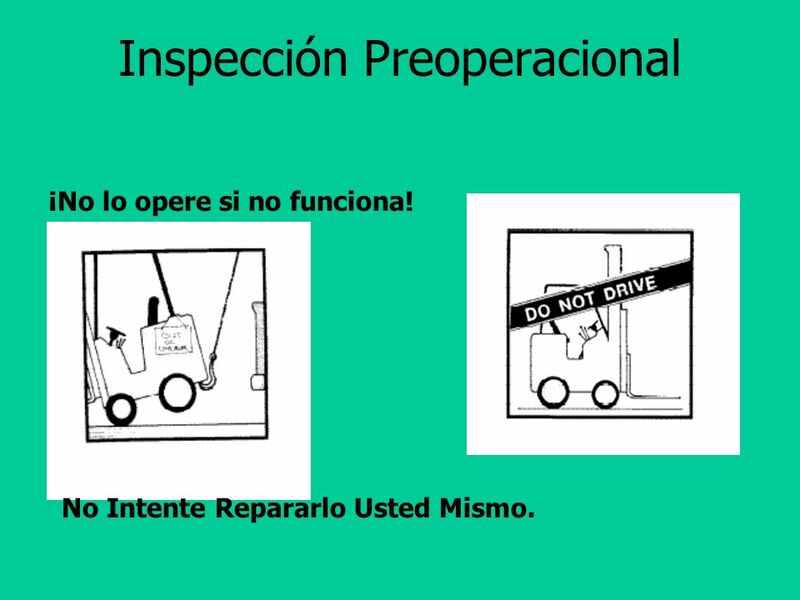 A safe truck operator will take the time to learn how a particular attachment will affect the operation of their PIT. 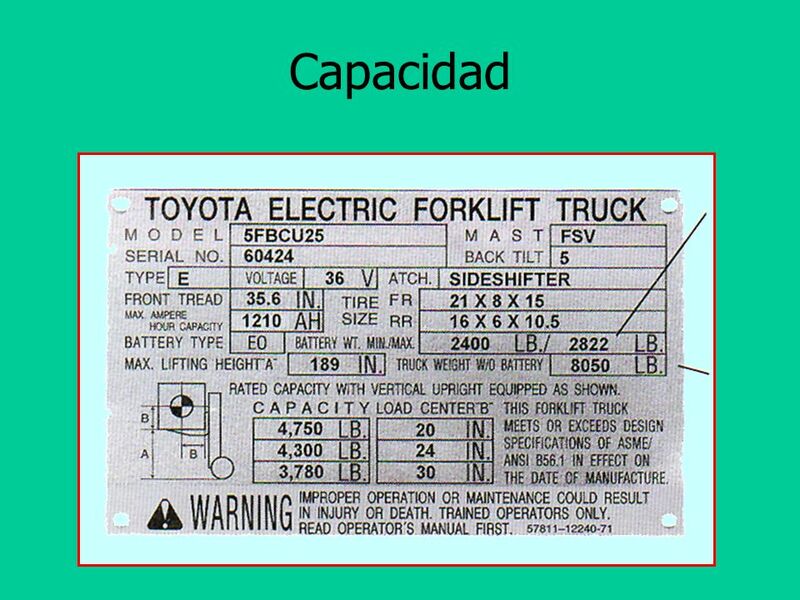 Information about lifting capacity and lifting height is found on the data plate as well as in the operator’s manual. 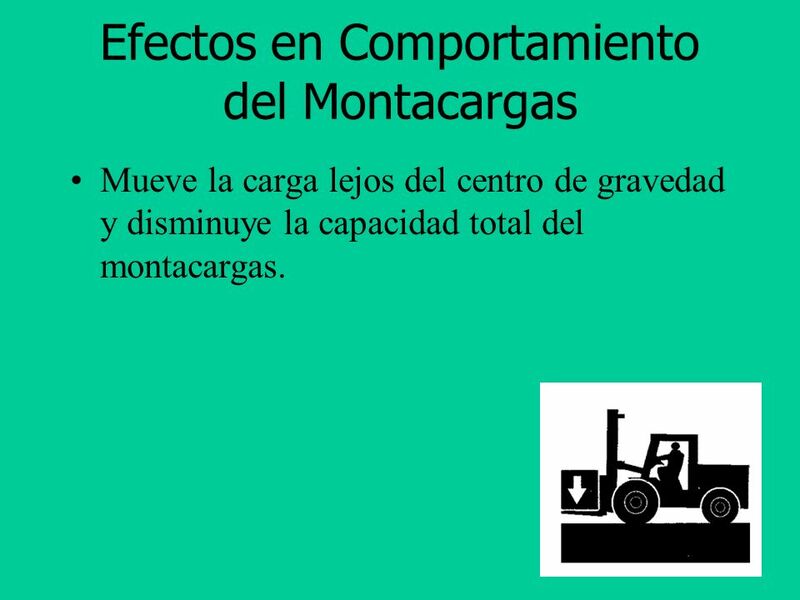 Mueve la carga lejos del centro de gravedad y disminuye la capacidad total del montacargas. 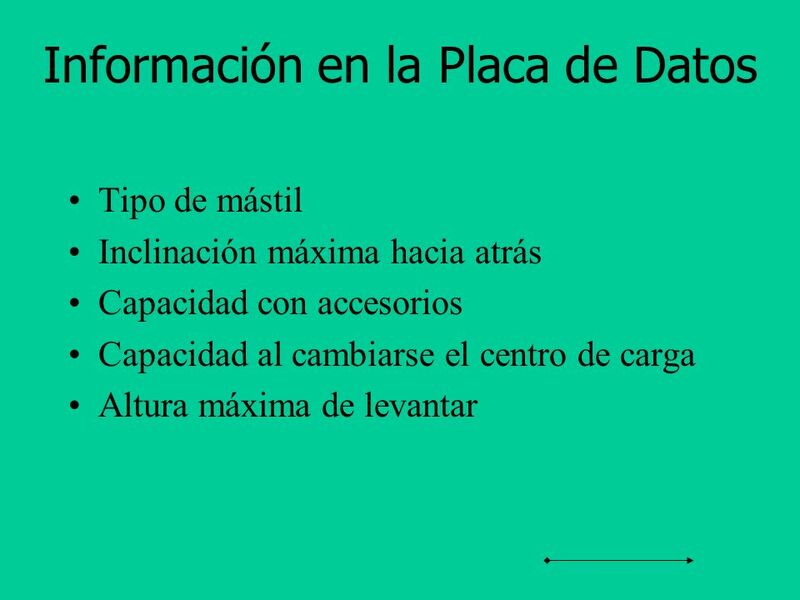 21 Estabilidad Montacargas de terreno desigual equipados con accesorios tienen que conducirse de la misma manera que uno con carga. 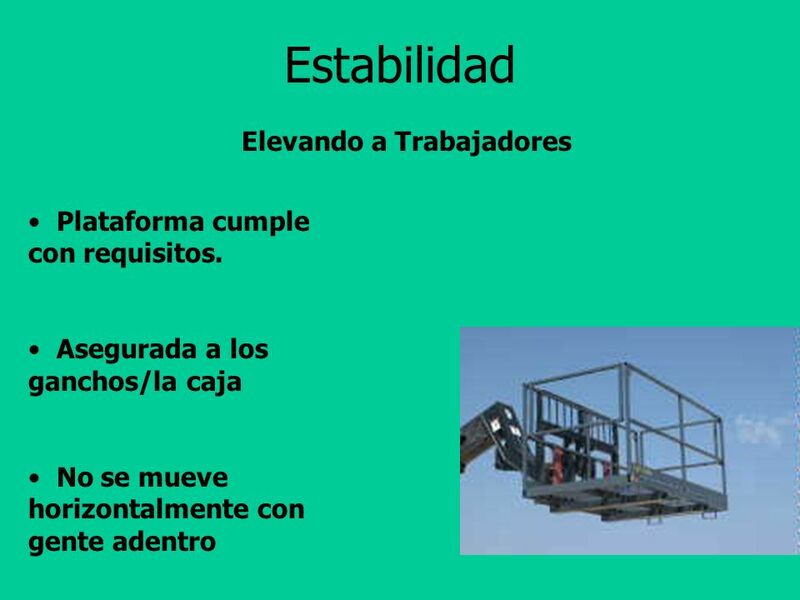 22 Estabilidad Elevando a Trabajadores Plataforma cumple con requisitos. 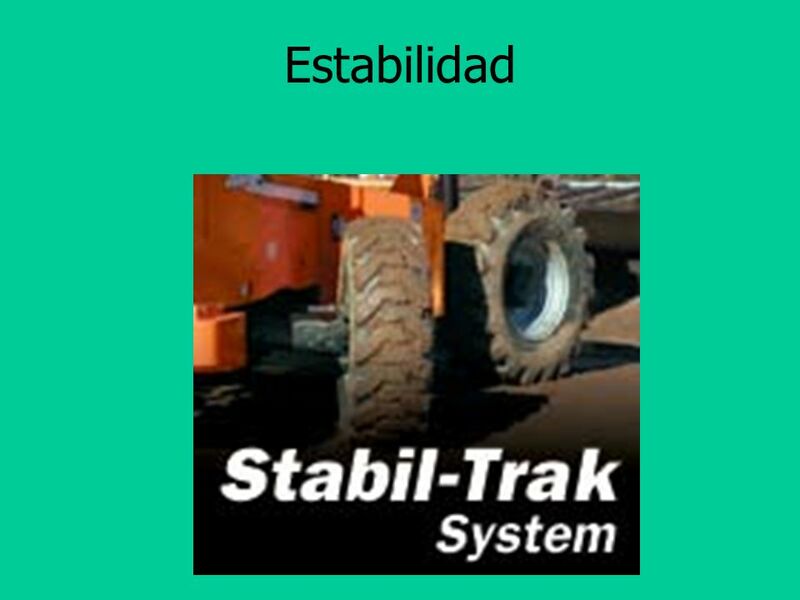 24 Estabilidad For rough-terrain forklift trucks equipped with lateral leveling: Level the frame before raising the boom or mast, with or without a load. 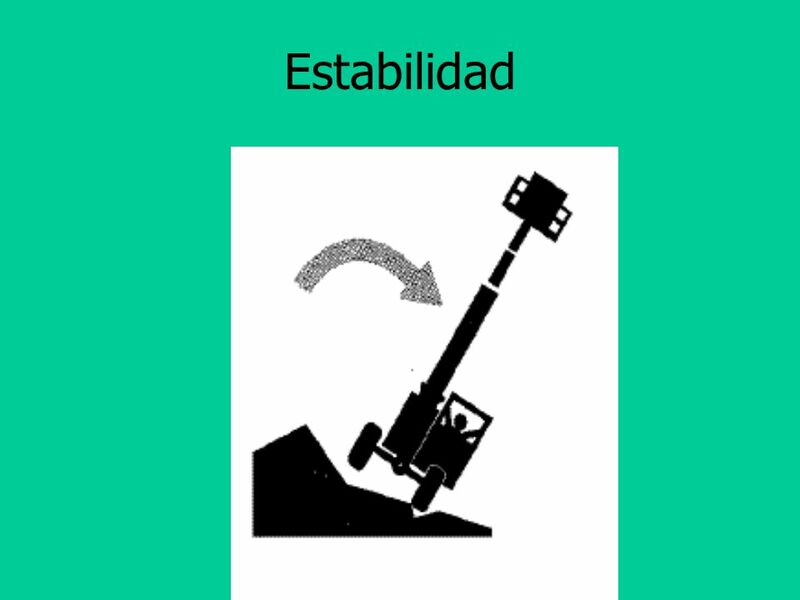 Lateral leveling should not be used to position an elevated load – lower the load and reposition the rough terrain forklift. 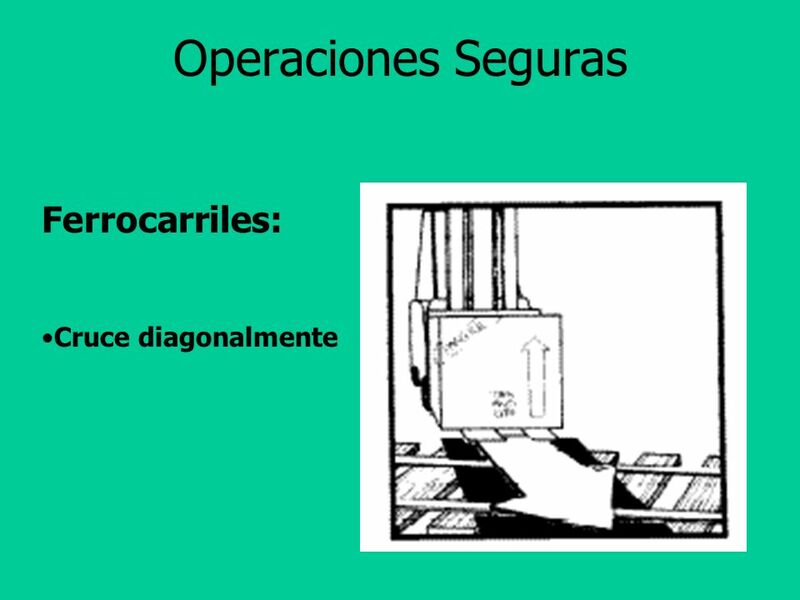 Es la responsabilidad del operador leer el manual del fabricantes antes de operar la máquina. 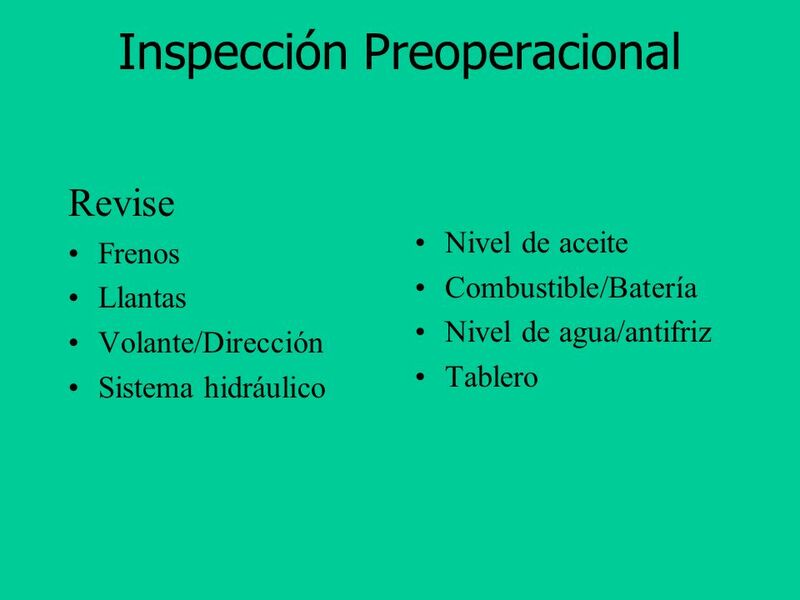 Revise Frenos Llantas Volante/Dirección Sistema hidráulico Nivel de aceite Combustible/Batería Nivel de agua/antifriz Tablero All these items should be included on your daily checklist. Antes de arrancar el motor: Siéntese y abroche el cinturón. 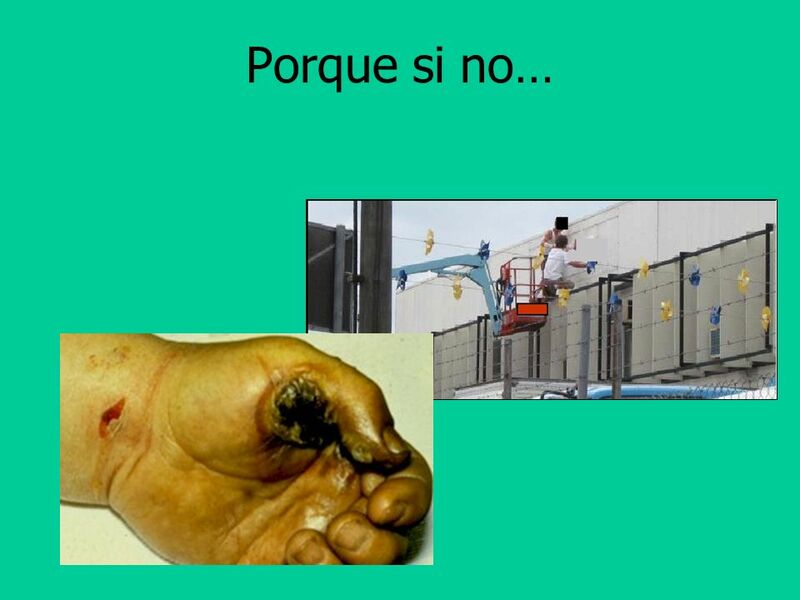 Aplique freno de mano. 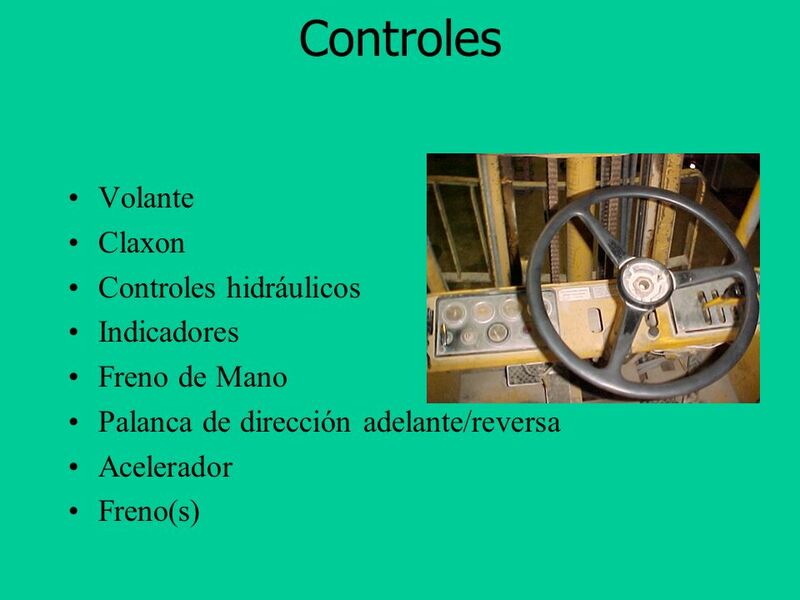 Ponga los controles en neutro. 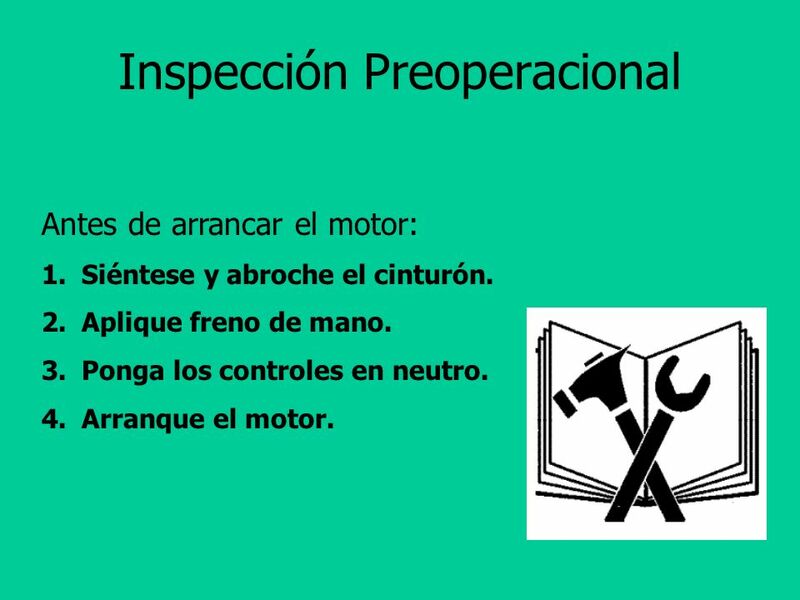 Arranque el motor. 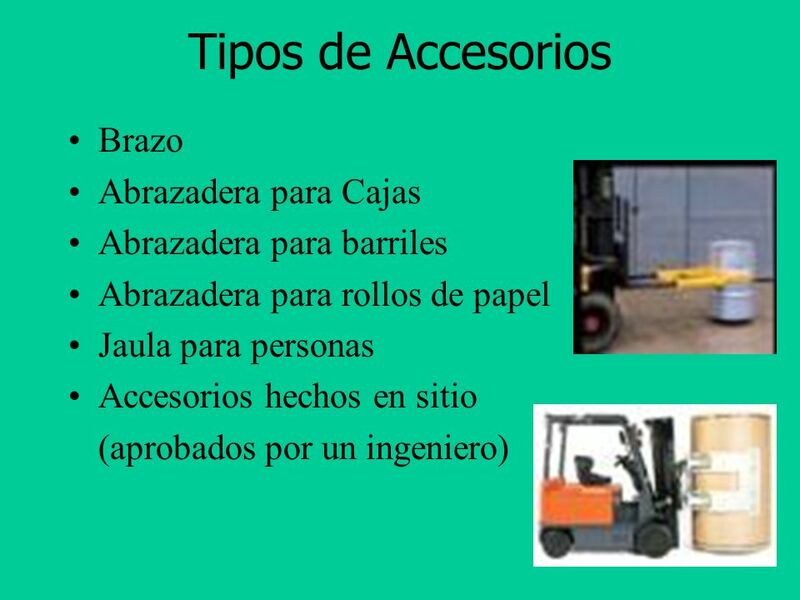 Do not start or operate the forklift, any of its functions, or attachments from any place other than the designated operator’s position. 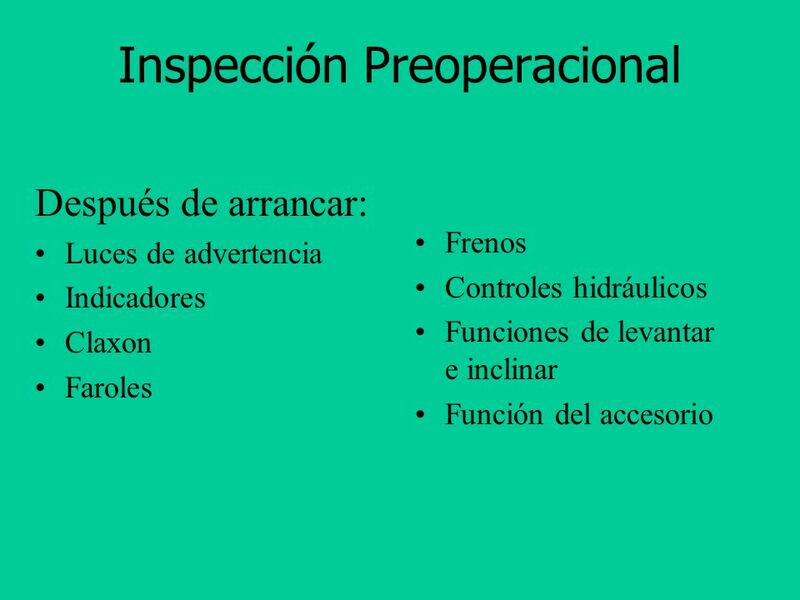 Después de arrancar: Luces de advertencia Indicadores Claxon Faroles Frenos Controles hidráulicos Funciones de levantar e inclinar Función del accesorio All these items should be included on your daily checklist. 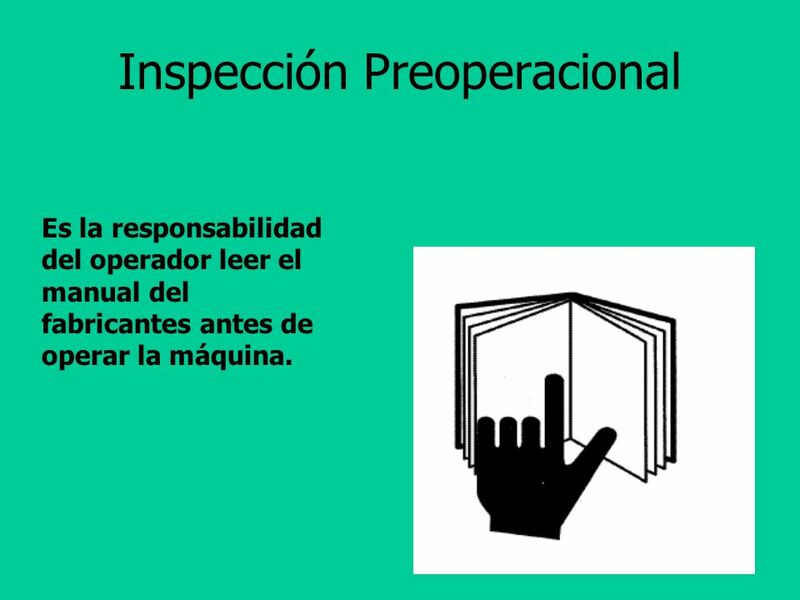 ¡No lo opere si no funciona! 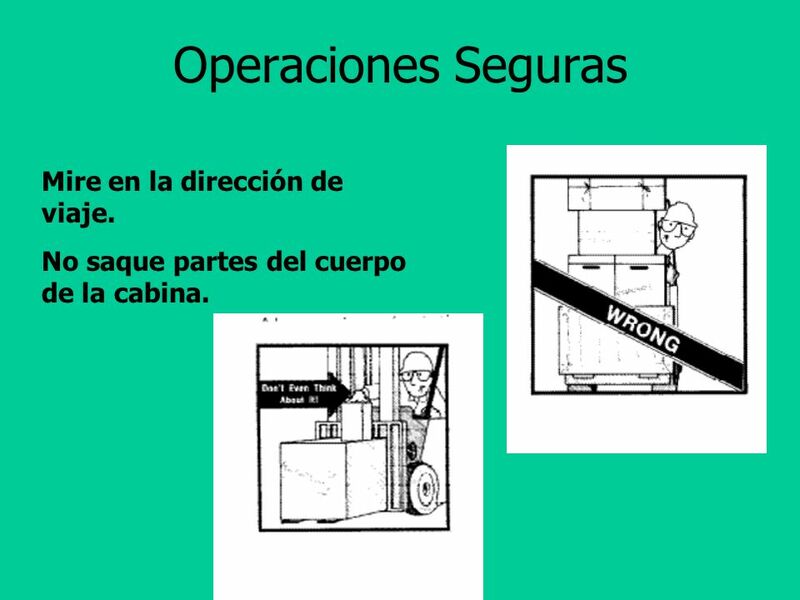 If mechanical failure occurs on the job, contact your supervisor. He will decide if the truck should be driven for repairs or towed. 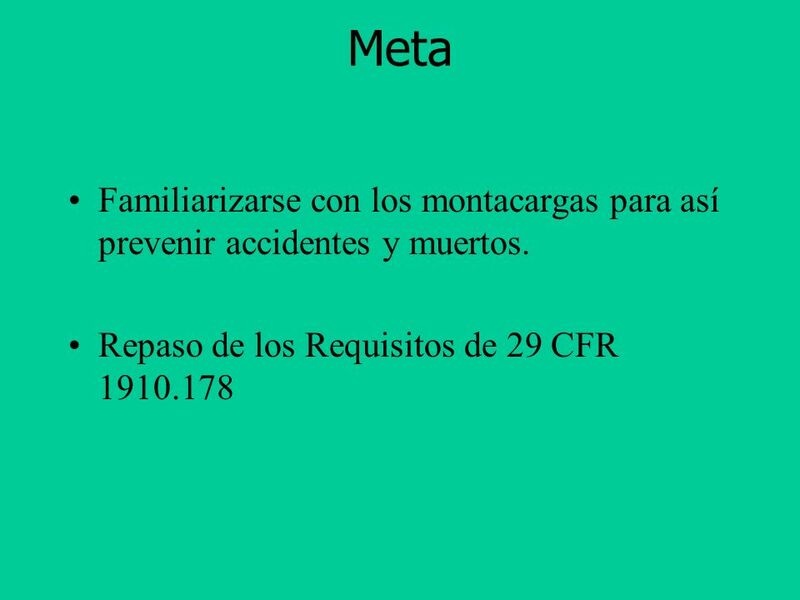 No Intente Repararlo Usted Mismo. 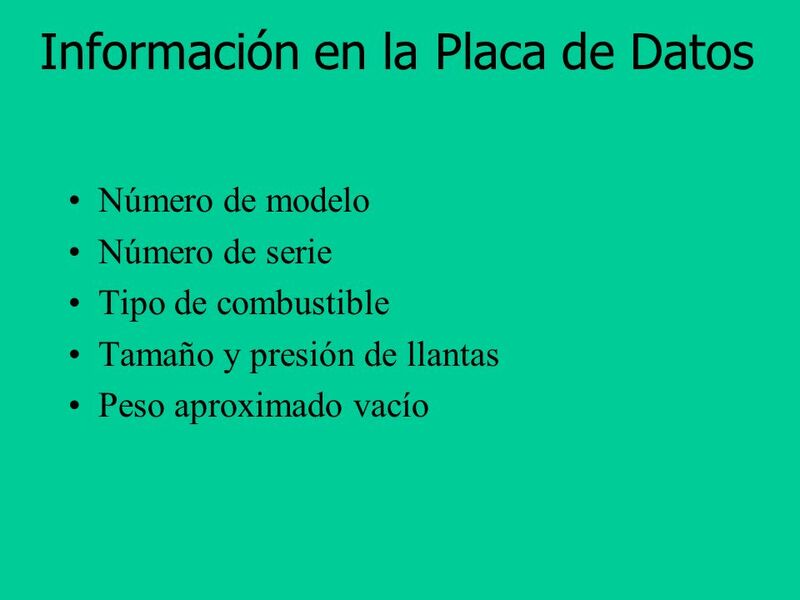 Se Prohibe Fumar al Cargar Combustible. 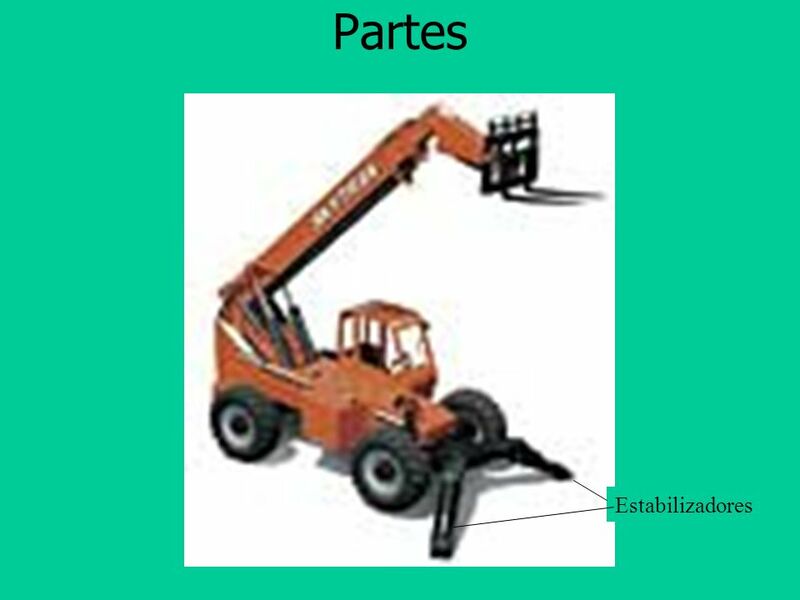 Conexión a Tierra No Celulares Ponga la Tapa Antes de Arrancar In case of a fuel leak, stop immediately, turn off the engine, and contact your supervisor. Do not attempt to make adjustments yourself. 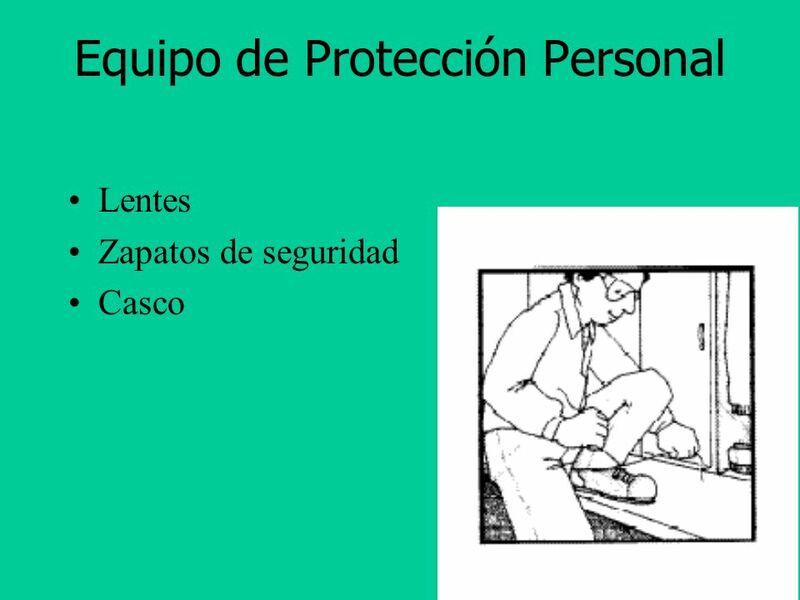 Lentes Zapatos de seguridad Casco You should wear approved work shoes. 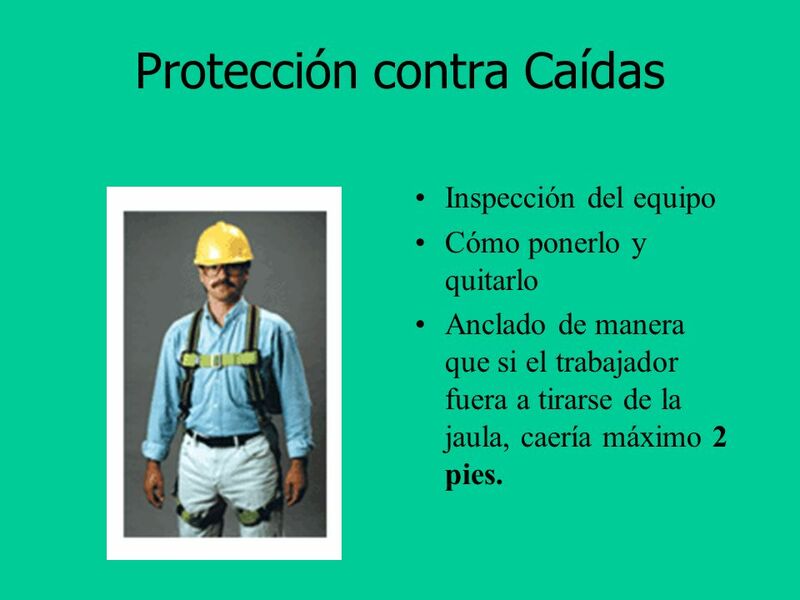 Safey shoes are strongly recommended. Approved eye protection shall be worn at all times. Head protection shall be worn where high-stacking operations are involved. 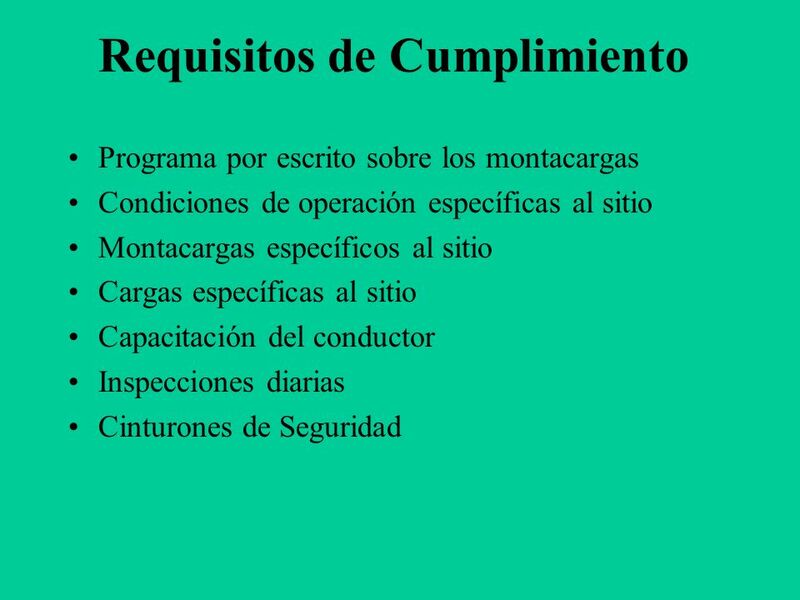 Inspección del equipo Cómo ponerlo y quitarlo Anclado de manera que si el trabajador fuera a tirarse de la jaula, caería máximo 2 pies. 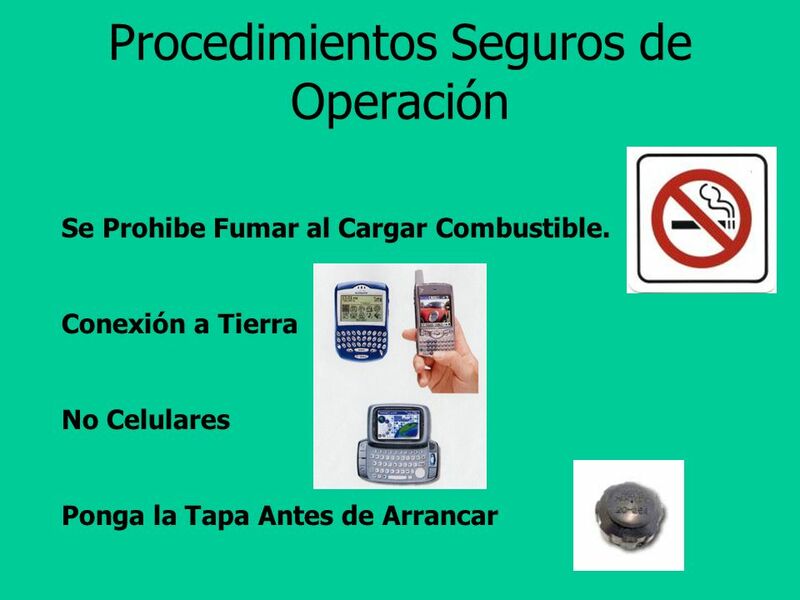 40 Operaciones Seguras Se prohibe comer, beber, o fumar al manejar. 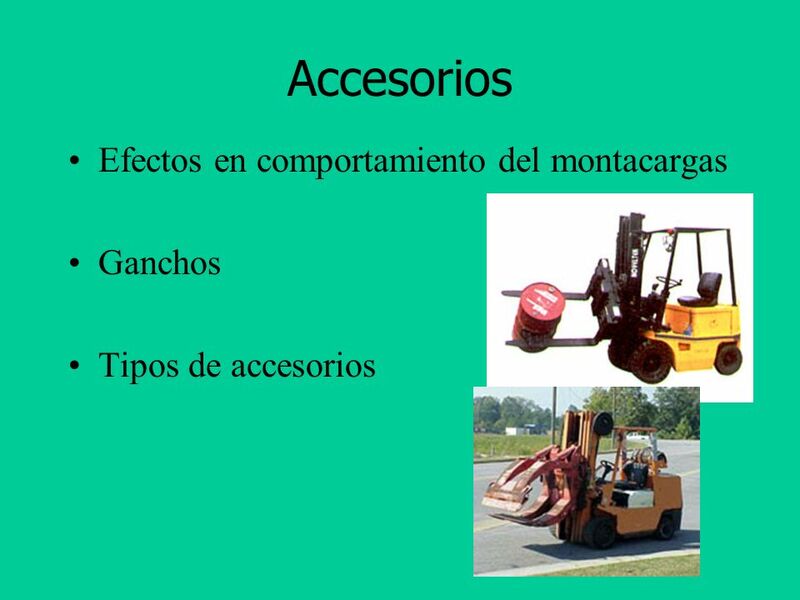 Mantenga control a todo momento. 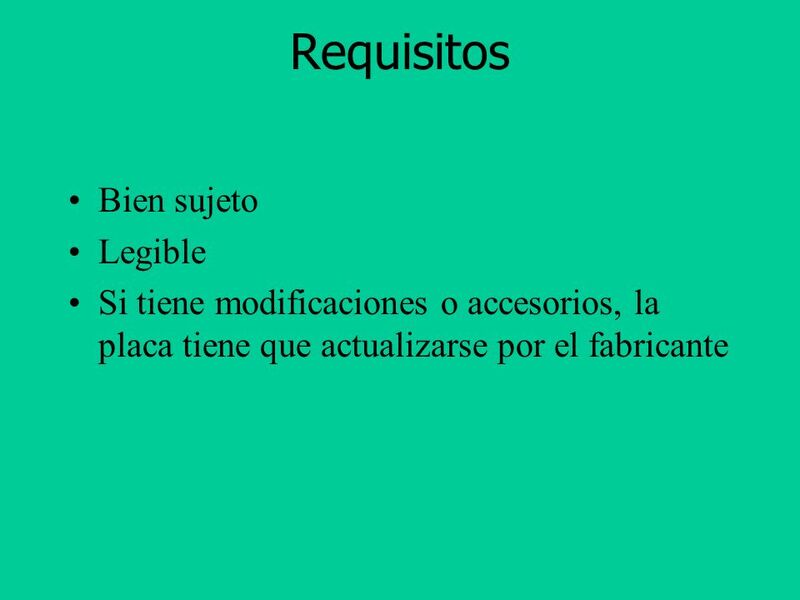 Se prohiben jugueteos y payasadas. 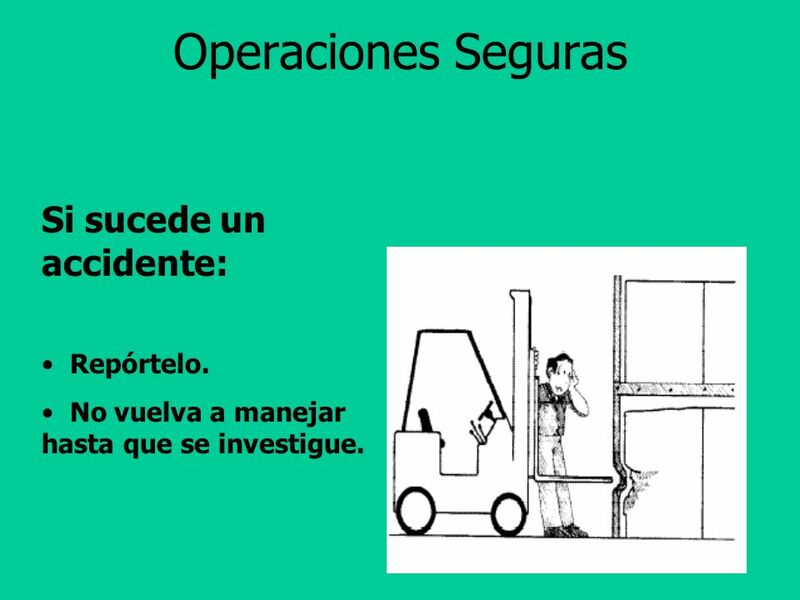 41 Operaciones Seguras Mire en la dirección de viaje. 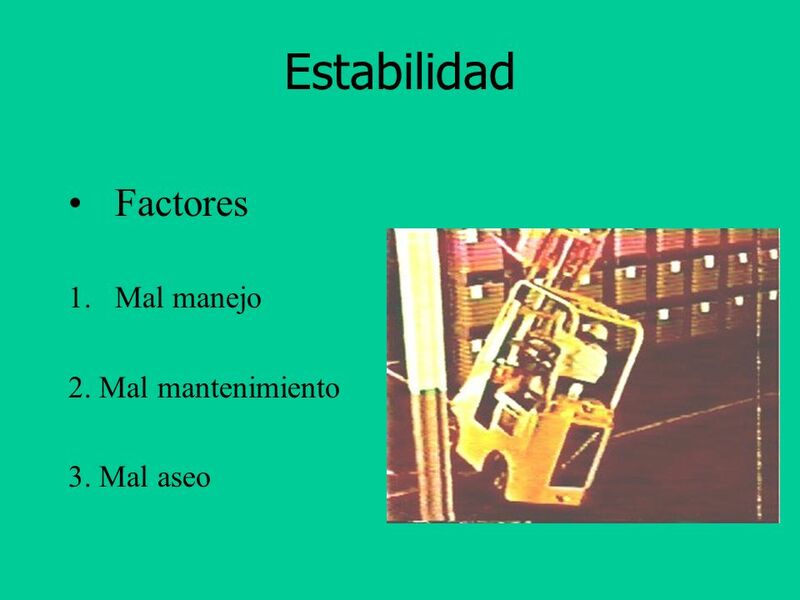 No saque partes del cuerpo de la cabina. 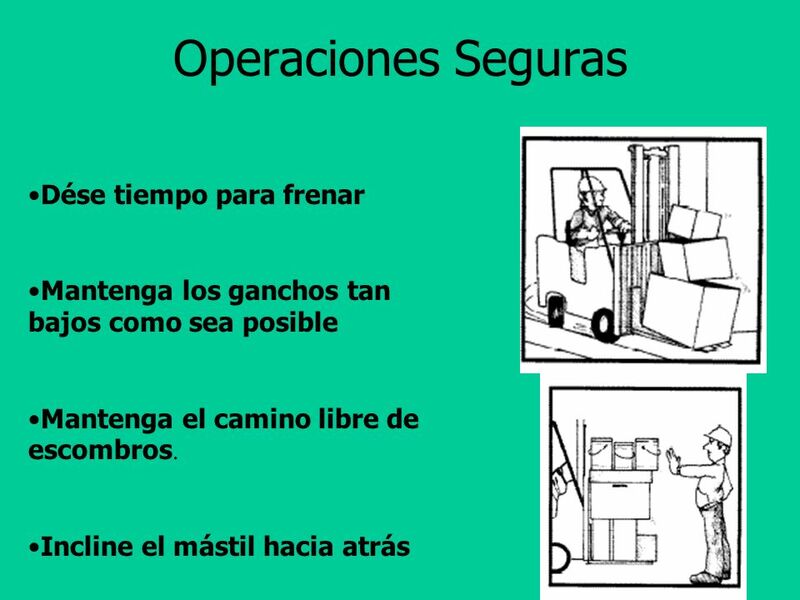 42 Operaciones Seguras Instale malla del lado del brazo para no poder salir de ese lado. 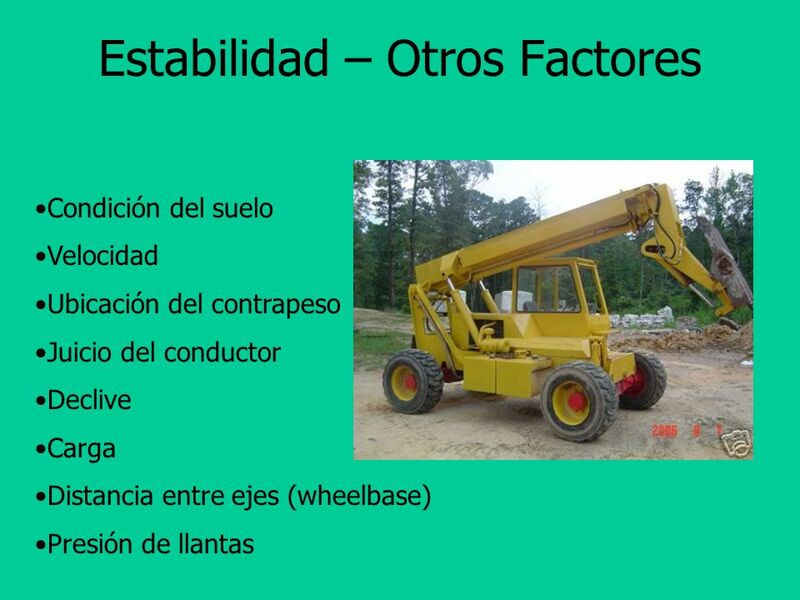 Many accidents have ocurred when operators get out of the cab on the boom side, and are crushed by the boom. 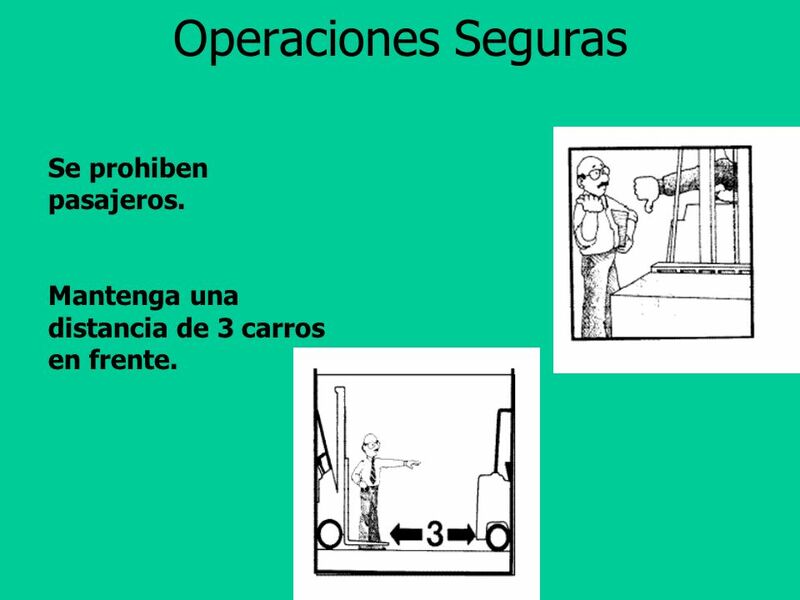 43 Operaciones Seguras Se prohiben pasajeros. Mantenga una distancia de 3 carros en frente. 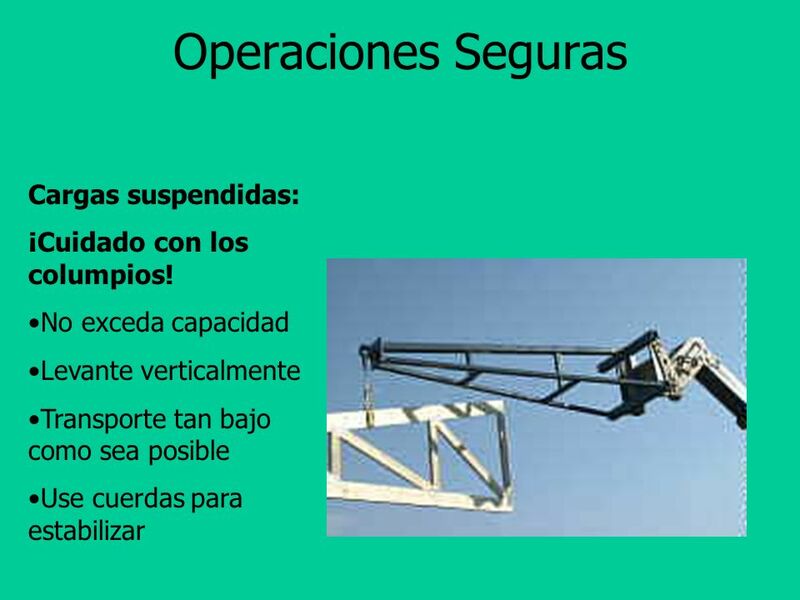 44 Operaciones Seguras Cargas suspendidas: ¡Cuidado con los columpios! 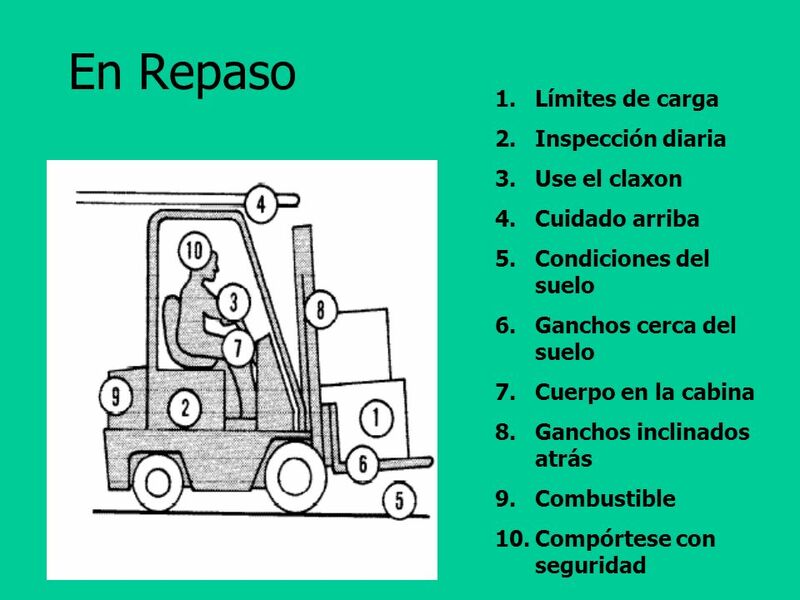 No exceda capacidad Levante verticalmente Transporte tan bajo como sea posible Use cuerdas para estabilizar The handling of suspended loads can introduce factors affecting the stability of the forklift. 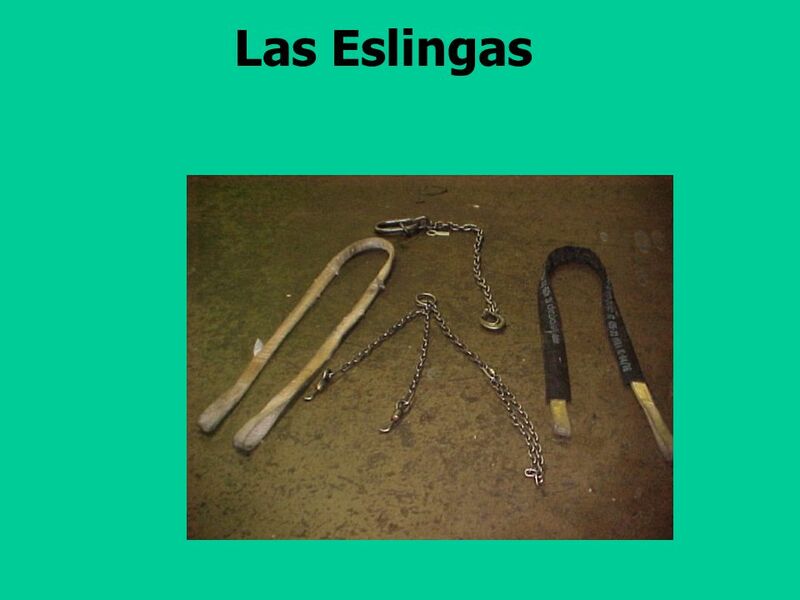 45 Las Eslingas All material handling accessories MUST be load-rated. 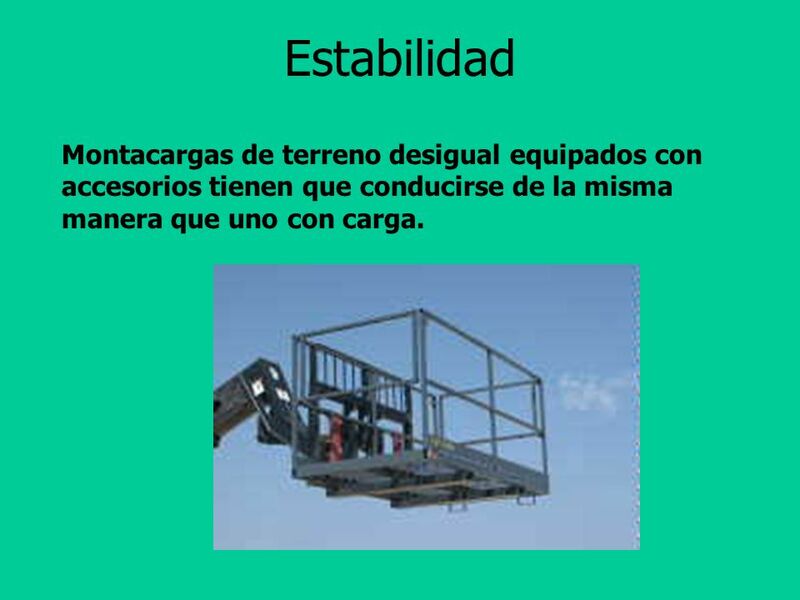 This information is found on tags that are attached to the equipment or is stamped on the equipment. 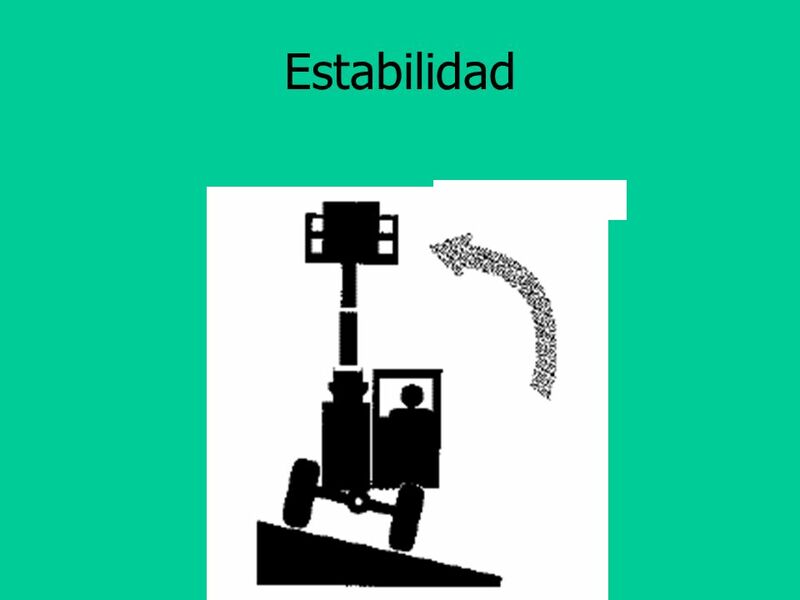 Mantenga los ganchos tan bajos como sea posible Mantenga el camino libre de escombros. Incline el mástil hacia atrás Additionally, start, stop, and turn in such a way as to avoid shifting or losing the cargo. 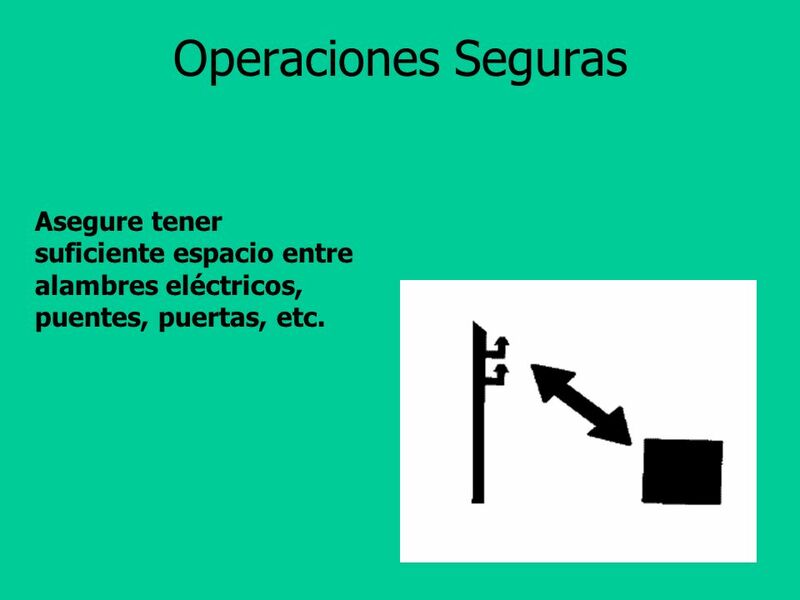 49 Operaciones Seguras Asegure tener suficiente espacio entre alambres eléctricos, puentes, puertas, etc. A construction worker doing sandblasting and painting work on an overpass on I-95 in Wilmington, DE was killed when a passing truck hit the high reach basket truck he was in, hurling him to the road below. The accident occurred at 12:30 am in a well lit construction zone. An investigation into whether the speed of the passing rig played a part in the accident is pending. 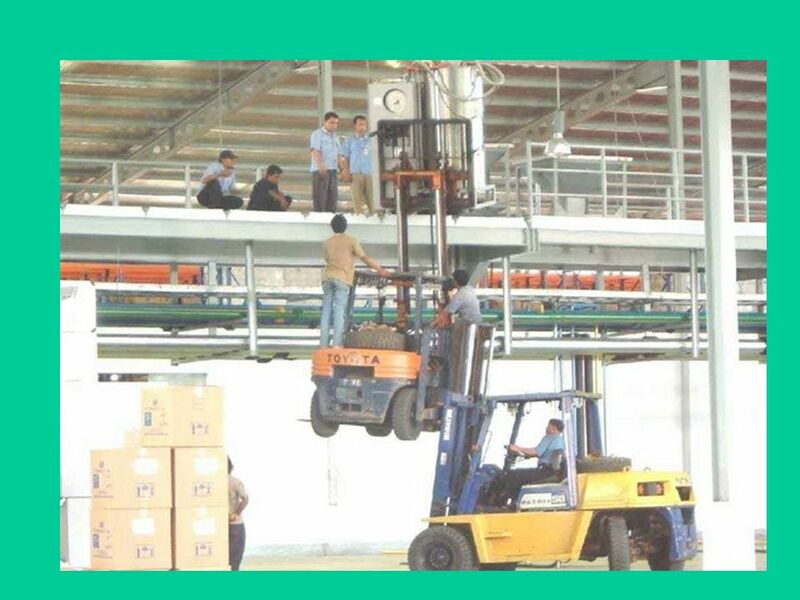 There was no immediate evidence that any fall protection equipment was being used. 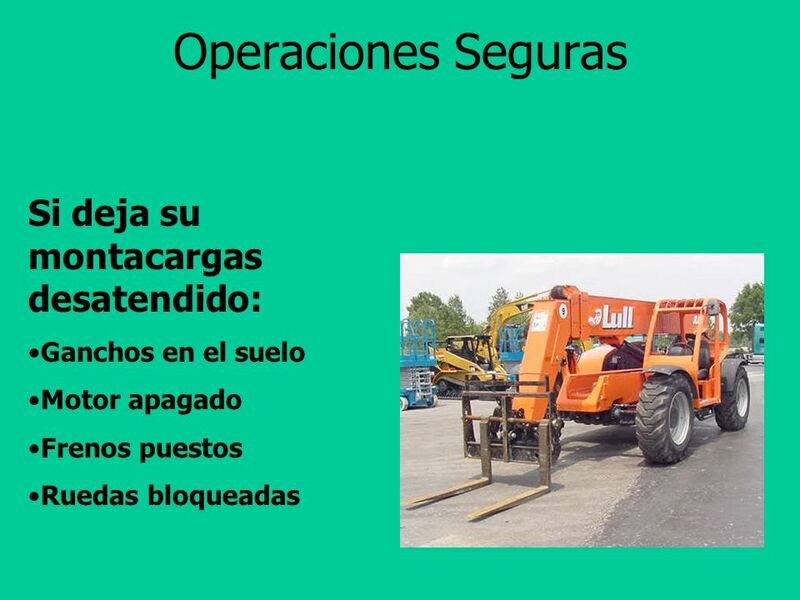 51 Operaciones Seguras Si sucede un accidente: Repórtelo. No vuelva a manejar hasta que se investigue. 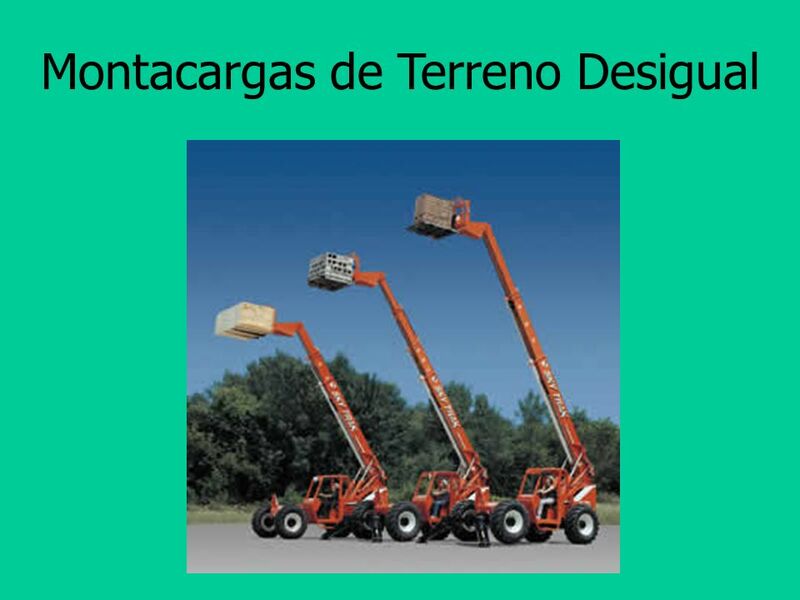 Descargar ppt "Montacargas de Terreno Desigual"